Yorgos Lanthimos’s (Dogtooth, The Lobster, The Killing of a Sacred Deer) latest and likely most accessible film is an outrageous period comedy with outstanding performances by Emma Stone, Olivia Colman and Rachel Weisz as its three central characters – all complex, flawed, entirely distinctive women. The early 18th century: England is fighting the French and a frail, capricious Queen Anne (Colman) sits on the throne; though the country is governed on her behalf by Lady Sarah (Weisz), a close friend who also tends to Anne’s ill health and mercurial temper. But as the politics of war begin to consume Sarah’s time, a new servant, Abigail (Stone) steps into the breach as the Queen’s companion; with a rapidly burgeoning friendship that gives Abigail a chance to fulfil her wider ambitions – not letting woman, man, politics or rabbit stand in her way. It’s already in receipt of substantial critical acclaim following its first screenings at Venice, where Colman also won Best Actress for her uproarious performance as the wounded, infantile, eternally faddish Anne, a bleak but really hilarious creation; and looks set to be garlanded further. A sometimes bizarre (racing lobsters, anyone?) 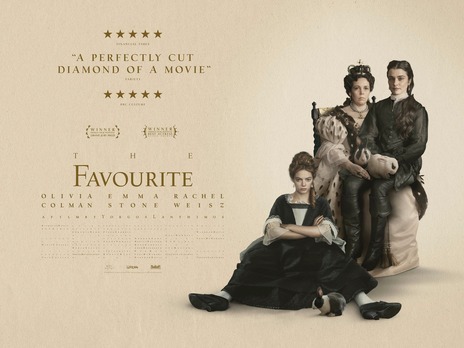 black comedy of status, The Favourite is full of scabrous, misanthropic wit (thanks to an original script by Deborah Davis and Tony McNamara) and wicked intrigue; a perfectly cut diamond of a film.